When you attend a school as large and diverse as Boston University, you’re bound to meet people from all over the world — people with entirely different experiences, languages and lifestyles than yours. And it’s an incredible feeling to get to know those people who are different from you; it breeds tolerance, acceptance and humility. 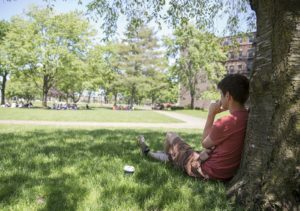 BU gives its students the world, and it’s up to us to decide what we do with it. I spent eight weeks of my summer at BU enhancing that experience by working as a program assistant for the Summer Challenge BU high school program. Every two weeks we would check in a new group of students, ranging from 150-350 students per session. The program was comprised of rising sophomores, juniors and seniors from all over the world — from right here in Boston, to Venezuela, Russia, India and Australia. Working for Summer Challenge was, of course, a challenge — but all the fun I had in the process made it worth every second. Never in my wildest dreams did I anticipate just how much those eight weeks would teach me. I met two girls from Saudi Arabia who nonchalantly explained to me that they essentially have no independence in the eyes of the government. Luckily, their parents weren’t too strict, so they had the privileges of traveling all over the world and attending an international high school where most of the students and their families are fairly liberal. They spent all of their free time venturing into the city together because, in Boston, they were free. I met a boy from Colombia whose parents were spending thousands for him to attend the program for two sessions, yet he humbly believed that $52 for a MicroFridge rental for two weeks was a lot of money. And a girl from the United States whose grandmother saved up for her to attend the program felt bad paying for the $25 appointment with Student Health Services because she wasn’t feeling well. Every single student that stepped foot into Warren Towers had their own completely unique story. I met a group of boys from Venezuela who explained to me that no one in their country has the freedom to just take a walk around the block, and instead they have to drive armored cars to friends’ houses. They go to riots with makeshift gas masks, and they keep $10 in their pockets at all times just in case they get randomly pulled over by a police officer and need to bribe their way out. It’s little details like these that slip past the news, unnoticed. Learning about their lives in the midst of chaos shocked and saddened me. But when I thanked them for telling me about their lives, and apologized if any of my questions made them uncomfortable, the Venezuelan students’ responses were all along the lines of: “I love my country, and I’m proud of it. It’s going through a rough time right now, but it’s a beautiful land and I could talk about it forever. I love Venezuela, and I hope it becomes safe for you to visit one day.” Such horrid things happen in their homeland, and yet they can still talk about it with a smile and a wistful twinkle in their eye. Regardless of how much they go through, they still appreciate the fact that they are alive to experience it at all. Just one handful of teenagers helped me realize that, no matter how chaotic the circumstances, my country is my home, and I should be proud of how much it can endure, while fighting for what is right.